No theme? No Problem! This is our standard-sized unit without an art panel. 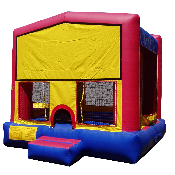 For a larger, no theme unit consider the Funhouse bounce house.